A wireless speaker small enough to fit in your pocket that still packs a serious punch. 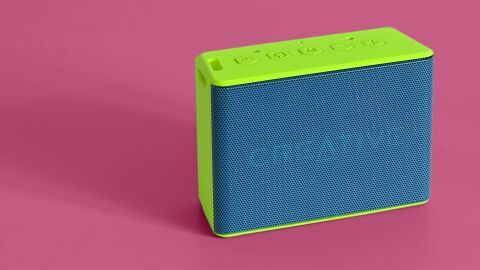 The Creative Muvo 2C is the Bluetooth speaker equivalent of a Swiss army knife. It has more features than some speakers five times the price, but can still fit in your pocket. This is also one of the smallest speakers that has a bass radiator, netting you proper bass rather than just a louder version of a tablet or laptop speaker. If you’re not interested in extra features like an onboard MP3 player, you might want to consider the Creative Muvo Mini instead. It’s larger but has a second active driver for even better sound projection. But in a pure sound to size equation, the Muvo 2C is hard to beat. The Creative Muvo 2C is a wireless speaker that can fit in your pocket. Ok, maybe not the pocket of your painted-on skinny jeans, but Creative has clearly put extra effort into making it pocketable. Rivals like the Jam Classic 2.0 and Sony SRS-XB10 have a much more bulbous shape, and take up more space. The Creative Muvo 2C is the kind of speaker you can take anywhere. It’s fairly tough too. Much of the shell is soft-touch plastic, but the front grille is metal and there’s a rubber flap that covers the ports. It provides splash-resistance, to the IP66 standard. This means it can take water jets rather than just a bit of drizzle, but can’t be dropped in a swimming pool or bath. The Creative Muvo 2C also has a cut out on one side to let you hang it from something. No lanyard is included, but do you do have a choice of colours. The speaker comes in black, green, blue, purple and red. Its extra modes set the Creative Muvo 2C apart from the budget competition rather than the little hardware extras, though. This isn’t just a Bluetooth speaker. There are three other ways to connect. You can use a 3.5mm cable, a common option, connect to a computer over USB to make the Creative Muvo 2C act like a sound card, or play music off a microSD card. The downside is that the Creative Muvo 2C is far more complicated than just about any other speaker in this class. You have to learn how to use it, although after living with it for a while, we don’t think it’s too taxing. On the Creative Muvo 2C’s top plate there are five buttons. Most are familiar: power, volume and Bluetooth. The fifth one flicks between modes, and there’s a multi-colour LED on top to let you know which you’re in. A blue LED means Bluetooth, yellow means MP3 player, purple USB and green aux input. The Creative Muvo 2C automatically uses Bluetooth when first switched on, so if you’re using the standard mode you don’t have to think about this Mode button too much. There’s also control through a phone app called Sound Blaster Connect. In theory this lets you switch between the modes and change the EQ profile of the sound. In practice, it simply doesn't work. The app is extremely unreliable, forever saying the Creative Muvo 2C isn’t connected when it is. You may have better luck, but this flakiness is disappointing given the app and speaker have been out for a while at the time of review. Multiple user reviews at Google Play cite the same kind of issue. The MP3 player part is limited too. You can switch tracks and folders with button press combos and even FLAC is supported, but there are no voice prompt to indicate what’s on and no shuffle mode. The Muvo 2C supports microSD cards up to 128GB, but this part works best if you keep it to 5-10 favourite albums. Bluetooth performance is, however, a completely different story. Range is good and connection stability is excellent, even through a wall. You can also change tracks using the buttons up top, using a combo of the Mode and Volume buttons. The broken app is a disappointment, not a tragedy. The Creative Muvo 2C also supports voice calling, using a pinhole mic by the top buttons, and even stereo pairing for a more room-filing experience. Again, this can be done without the phone app. You’ll get six hours’ use out of a charge, which is only just enough for comfort, but fairly good when you look at how small this speaker is versus how large it sounds. You could argue the Creative Muvo 2C tries to do a little too much for its own good. Sure enough, this isn’t the best choice for someone who struggles to get the basics of their phone working. However, for those with a bit of tech confidence this is one of the best tiny, low-cost speakers around. The Creative Muvo 2C’s sound steamrolls that of popular entry-level units like the Jam Classic 2.0, largely because of the panel across its back. This is a passive radiator, which is a second speaker driver powered by the air movement created by the treble/mid active driver on the front. You can see this little guy moving back and forward like mad as soon as there’s even a hint of bass in your music. It helps give the Creative Muvo 2C remarkably full and powerful sound for a “palm size” speaker, as Creative calls the 2C. As such it’s closer to a baby alternative to something like the Bose SoundLink Mini II or UE Wonderboom rather than just an upscaled laptop/tablet speaker. We’re also fairly impressed by how little the Creative Muvo 2C distorts at maximum volume. Unlike most small speakers with a single drive unit, it doesn’t become “shouty” or more harsh, and the passive radiator only distorts in extreme situations. Single passive radiators are prone to a sort of farting noise as they strain against their limit if not engineered properly. The Creative Muvo 2C doesn’t do this, no matter how hard the radiator is worked. Part of this is careful control over volume. The Muvo 2C is loud enough to reach an anti-social level in an office, loud enough to let you hear tunes in the shower over the sound of the jets and loud enough for a picnic at the park. It’s also a near-perfect holiday speaker, particularly as you can load it up with a microSD filled with songs. That said, it is not really powerful enough to compete with the conversational hubbub of a party, or wide open spaces. This is one of the smallest speakers that can make listening to music enjoyable. Bass drums have actual bass, and dynamic range is leagues above many speakers of this size. There are naturally compromises, though. The first stirrings of the Creative Muvo 2C’s bass start at about 65Hz, but significant output begins much closer to 100Hz. It can’t reproduce sub-bass, struggles with low bass, and larger units like the Jam Heavy Metal produce far better, deeper bass for around £30/$30 more. Compared to these next-level speakers, the Muvo 2C also sounds a little coarse and unrefined. Creative has done a great job of avoiding this ever tipping over into pure harshness, though. That speakers twice the price sound better should come as no surprise. The Creative Muvo 2C is one of the smallest speakers that sounds good. Its hard-working passive radiator gets you the classic effect of the best portable speakers: “wow, this thing sounds bigger than it looks”. It’s also almost ridiculously feature-packed, able to double as a laptop sound card and a standalone portable jukebox. We wish Creative would fix its effectively broken companion app, and if you can stomach the extra size and cost of the Jam Heavy Metal, the upgrade is worthwhile. However, this is a fantastic speaker if you want something that can actually fit in your pocket.